My lovely mother in law was kind enough to gift me two 1/2 yard cuts of some Lotta Jansdotter prints she bought last month and decided not to use. I think her fabric hoarding days are over, where as mine are in **ahhemm** full swing shall we say. So needless to say I couldn’t turn down such a generous donation! 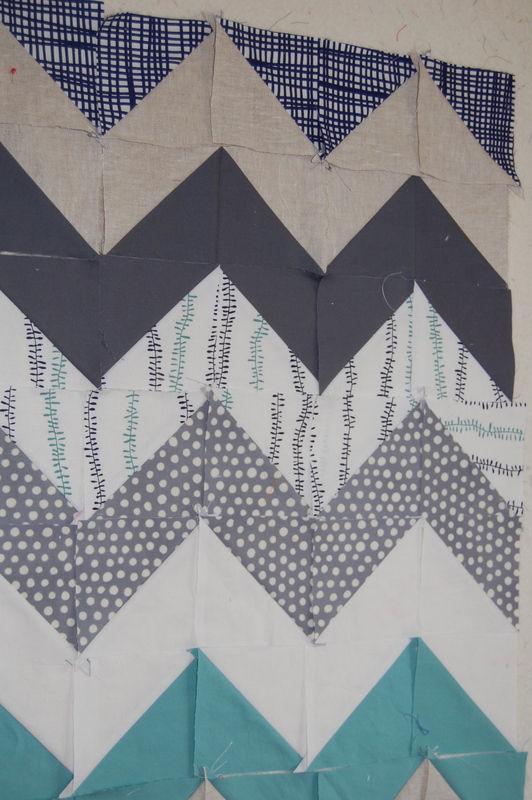 I still have Chevrons on the brain, an obsession that has been slowly gaining momentum and I wrote about here last week. That, along with these two lovely LJ prints were my inspiration for the beginnings of a cute little baby quilt. I added a few of my favorite Kona solids and some linen. Oh, and I couldn’t resist putting in my leftover Mingle Dots in Steel to compliment the LJ prints. Working on this design has been such a valuable experience for me as I have never even attempted any kind of HST design before, at least not knowingly :-). 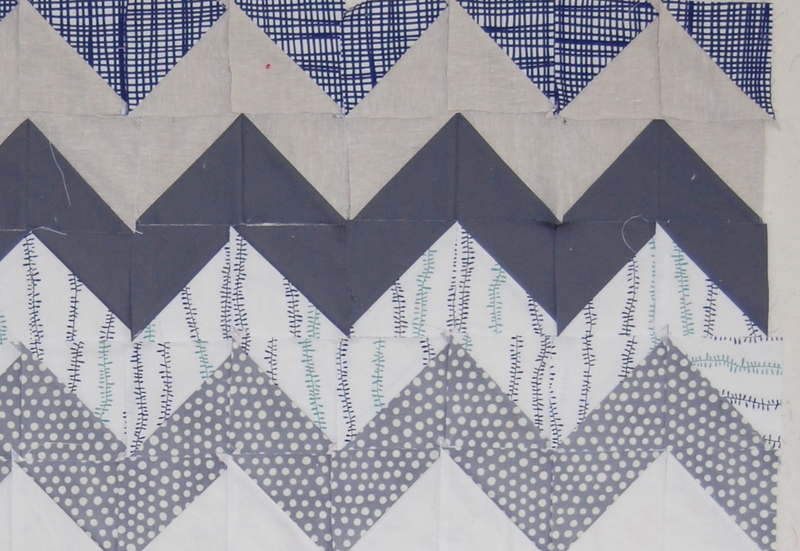 It’s funny that after a few years of quilt making experience and a few proud quilting moments under my belt, I could still be so clueless about something as basic to quiltmaking as half square triangles. **Sigh** so much to learn in this lifetime……. It feels good however to be working on something so new to me and yet so completely relaxing at the same time. There is something very soothing and methodical about it that I find enjoyable. 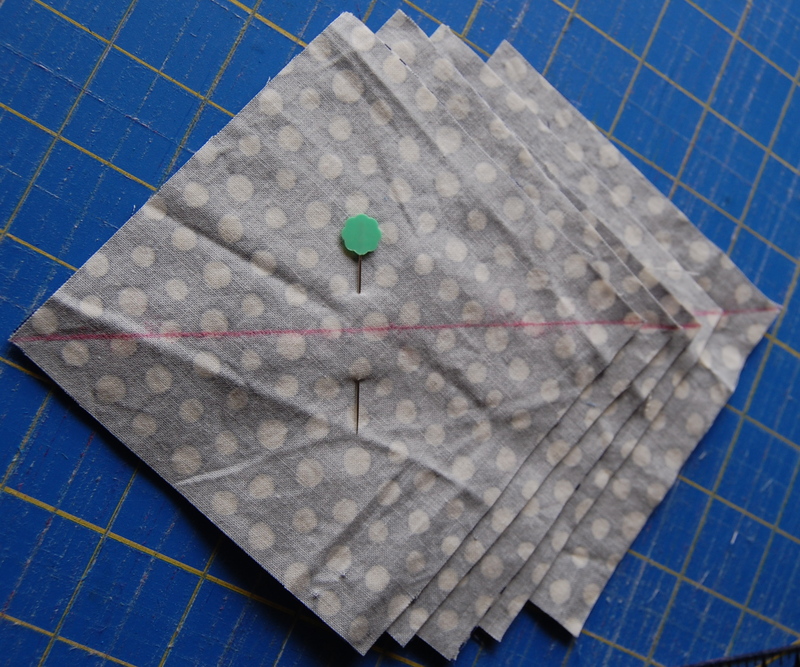 For this design I started with 4.5 in squares which cut down to 3 in HSTs. 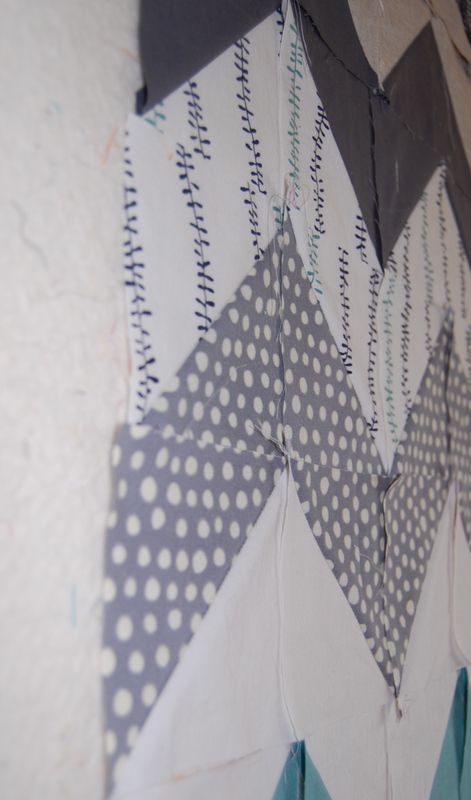 I’ll tell you my biggest challenge in this quilt so far has been getting LJ directional print to be consistent AND vertical (you’ll notice I have to go in and fix the one on the far right toward the bottom). 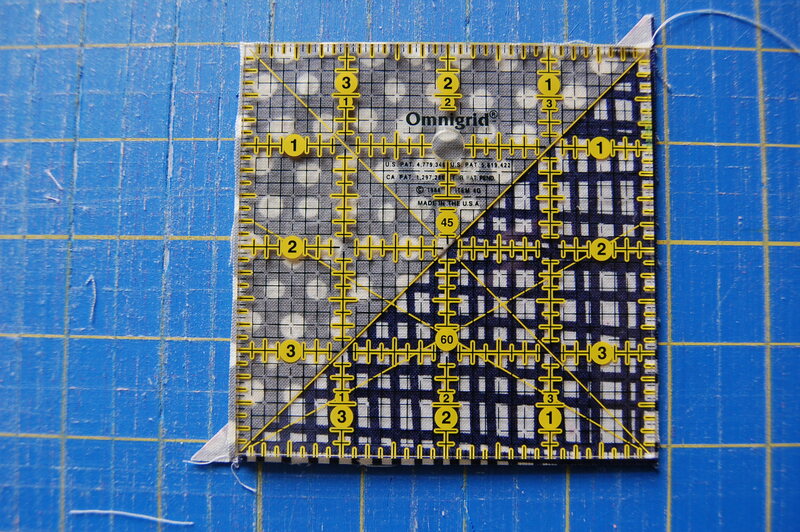 Ugh, that was hard and unfortunately I used up several of my squares of that print, trying to figure it out. Thankfully, I noticed it BEFORE I sewed it all together. Oh how I love my design wall!! Hoping to have this little guy finished up by next week, it’s a longshot with all that life is holding for me these days, but it’s something to work toward. I’m linking up with Lee’s WIP Wednesday; and Judy’s Design Wall; lots of fun progress being shared over there. Hope you’re all having a great week and making some creative progress of your own!! Just loving this! Reminds me a tad of the Arroyo Verde School colors BUT they look much nicer in this design of yours. Can’t wait to see the finished product. Have a wonderful Wednesday! Ooooh. I love this! I think the blues are fantastic! And the Chevron pattern looks really sleak! Can’t wait to see how you quilt it!